TechEd 2008 is officially underway. The shiny Telerik booth is once again standing tall the expo floor, the demo videos are rolling, and the people are flocking to grab their swag. If you're in Orlando and at TechEd, definitely make sure you stop by our booth (#1101) and get your free .NET Ninja or Geekette t-shirt. For everyone else, stay tuned this week and I'll try to bring you regular updates from the floor (as promised). Hopefully you've already seen my coverage of this morning's Gatesnote- his last public speaking engagement as a full-time Microsoft employee. There wasn't much new shared in the keynote, but we did get official confirmation that Silverlight 2 beta 2 will be available by the end of the week. That's good news for you Silverlight fans out there. The work on this product is already underway and the data visualization experience of the team building these gauges is incredible. You can count on Telerik to begin shipping gauge components towards the end of this year, starting on the WPF platform. If you're looking for another good reason to download our RadControls for WPF beta and starting the process of WPF application development, add Telerik gauges to your list. For now, it's back to the TechEd booth activity. Look for more updates and more announcements as the week goes on- there are still some really fun ones left. Keep it up Todd. I am interested to see if any new content comes out that wasn't mentioned during the recent Orlando DevConnections. What's your perspective of this conference vs. the DevConnections? I dunno. With the new split format (Dev week/IT Pro week), the energy feels about the same as a DevConnections. 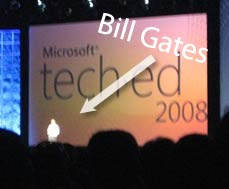 The keynote at TechEd is obviously better, as is the MS product team presence, but otherwise the events are very similar. If I had to pick one to attend, I'd pick TechEd. But if I could only make DevCon, I wouldn't be missing much.